The files cover the early 1960s - the heyday of the IRD, when it employed between 400 and 600 people, according to Paul Lashmar, author of Britain's Secret Propaganda War. The team was funded by the so-called "secret vote" - where government money not subject to parliamentary scrutiny was used. In 1960 that included Neal Ascherson - then a young reporter at the Observer newspaper who was introduced to the IRD by Edward Crankshaw, a more senior Soviet specialist. "After I'd been looked over and tested... I was allowed to receive the news bulletin of eastern European 'product'." The IRD information was delivered by hand and treated as secret - but Mr Ascherson said he "very rapidly discovered it was completely useless", since it contained "stale, out of date" news. In 1963, African students in Bulgaria made international news. Scores had left the country, claiming racial discrimination, and the IRD decided to use this to "intensify indignation... against Bloc countries". On fake headed notepaper, the IRD circulated a press release to hundreds of newspapers and opinion formers - sending the releases via the British diplomatic bag which meant they would have the right postmark. 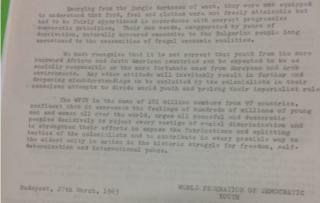 The press release - reprinted in full by a news agency in Zanzibar - included an offensive statement that the Africans "emerging from the jungle darkness of want, [they] were not equipped to understand that food, fuel and clothes were not freely attainable..."
It is not known what - if anything - happened to those people the IRD had named.